It’s been 10 months since nearly a million women marched on the National Mall the day after President Donald Trump’s inauguration, creating a display of sisterhood that reverberated from the streets of the nation’s capital, across the country and world. Beginning Friday in Detroit, the organizers behind the historic Women’s March will host their inaugural Women’s Convention, aiming to turn that massive demonstration from January 21, 2017, into a sustained, intersectional movement. 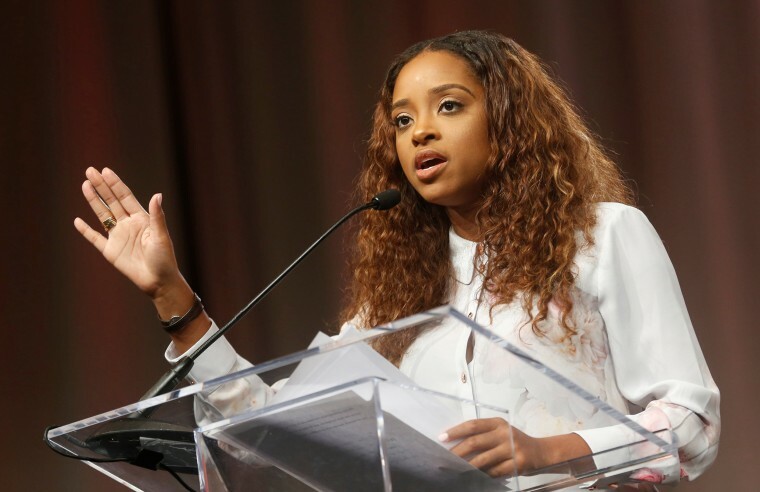 Women's March leaders Tamika Mallory, Bob Bland, Linda Sarsour, and Carmen Perez ,working jointly with a network of coordinators and volunteers, have put together a convention which reflects “a comprehensive, intentional and inclusive process” from grassroots activists, movement leaders, and partner organizations across the country. The confab’s official theme is "Reclaiming Our Time" — a nod to Rep. Maxine Waters, D-Calif., — whose “reclaiming my time” remarks went viral after the Congresswoman asserted her authority during a House committee hearing in July. Waters is among a long list of elected officials, activists, celebrities, and community members expected for three days of workshops, forums, strategy sessions, speeches and socially conscious entertainment. The confab, headquartered at the city’s Cobo Center, ends Sunday. The event is reportedly sold out. In a statement, Waters said that while speaking at the Women’s March, she was inspired by the movement unfolding "millions of women coming together to stand up and fight back." Other congressional speakers include Sens. Debbie Stabenow, D-Mich., Kirsten Gillibrand, D-N.Y., and Amy Klobuchar, D-Minn. Reps. Brenda Lawrence, D-Mich., Debbie Dingell, D-Mich.. Political strategist Symone Sanders, activist Brittany Packett, actresses Rose McGowan, Amber Tamblyn, and Piper Perabo are also speaking. Waters is expected to speak on Saturday night. Related: Peace, Positivity as Massive Women’s March Makes Voices Heard in D.C. Sessions range from training women running for office to reproductive rights and environmental advocacy. The gathering will also host film screenings and social events, including a Social Justice concert headlined by R&B recording artist Melanie Fiona and singer Alice Smith. The timing of the convention dovetails with the country’s divided political and social climate, as well as topical issues such as the recent allegations of sexual harassment of women by high-powered men that have garnered recent headlines. Since the 2016 election, large numbers of women motivated by the results have expressed an interest in running for office. Emily's List, the nation's largest resource for women in politics, will do candidate training at the convention as “a nationwide effort” to recruit and train Democratic women around the country leading up to the 2018 midterm elections. “The only silver lining that has come as a result of the Trump presidency is that all across the country more women are speaking out, fighting for the causes they believe in, and running for office in record numbers,” said Rep. Gillibrand in a statement. Convention organizers said they hope attendees will be inspired to make new connections and gain skills and strategies to work towards “collective liberation” for all women. Women's March logistics coordinator Janaye Ingram said the event is "for the people, by the people." “It’s important in this moment that we collectively leverage our power from the march to create change. It’s now time to get down to brass tacks and begin strategic organizing,” said Ingram.